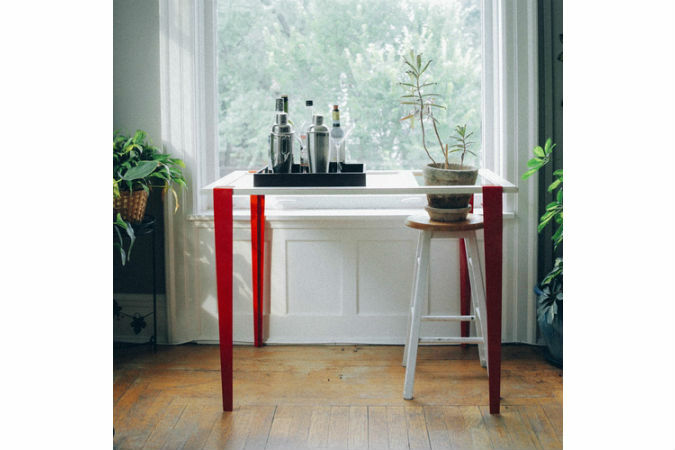 I think these Floyd legs are a very smart idea – they attach to any flat surface to create a table. The legs come in two heights (one is for coffee tables and the other is for a desk) and several different colours. The clamps are removable so you can easily move the table, or change the table size or change the type of material in the table. I think it's a stylish look and such a practical idea – a simple DIY that gives you tons of options! The legs can be ordered at thefloydleg.com and they will ship to Canada for an extra cost. Here are some ideas of what you can make with them, they also now sell brackets to create shelving. One thing they mention is that these are best for mid-weight materials and also aren't meant to be huge dining tables (they can't handle that kind of weight). I hope to be trying out the coffee table legs, using an old thick plank of wood I have. The big decision is what colour leg to go with!